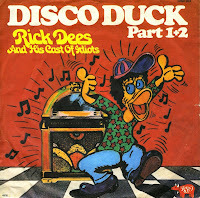 Born Rigdon Osmond Dees III in Jacksonville, Florida on March 14, 1950, Rick Dees recorded the novelty song 'Disco Duck' in 1976, during the disco craze of the late seventies. The story within Disco Duck centers around a man at a dance party who is overcome by the urge to get up and "get down" in a duck-like manner. When the music stops he sits down, but when he decides to get up and dance again, he finds that everyone in the room is now doing his dance. The song sold millions of copies worldwide, reaching number 4 in the Dutch Top 40 and number 6 in the UK singles chart. As a child who loved "duckies", this single was one of my favourites at a very young age. I bought it two years ago for nostalgic reasons. It's still a great disco track.